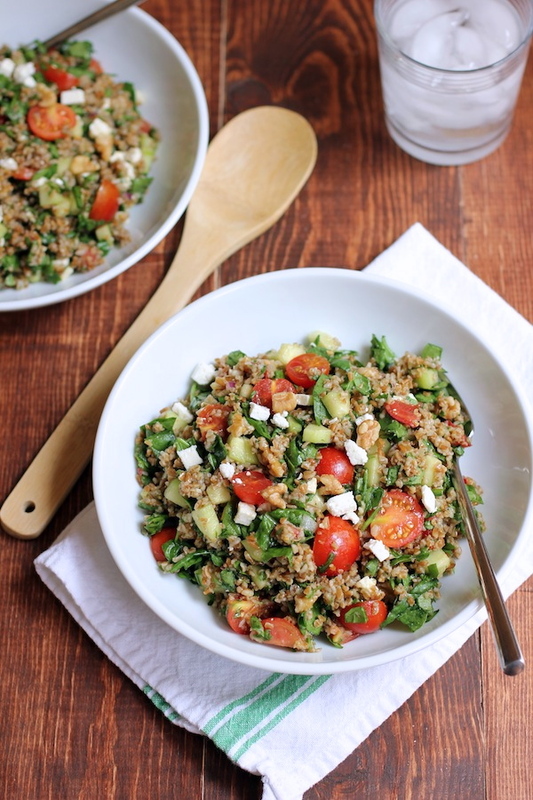 Here’s a colorful bulgur salad that’s made with sweet cherry tomatoes, cool cucumbers and fresh baby spinach. Bulgur is a chewy grain with a mild nutty flavor. I’m always surprised that bulgur isn’t extremely popular – it’s a whole wheat grain, it has a wonderful taste, it’s high in fiber and it’s very filling. This is an easy salad to put together. While the bulgur is cooking, you prep and dice the other ingredients so everything is ready to be tossed together once the bulgur is done and has cooled slightly. Add some walnuts, red onion, feta and a simple red wine vinaigrette and you’re done. I used Bob’s Red Mill Quick Cooking Bulgur Wheat. It takes about 14 minutes to cook on the stove top. I don’t use the type of bulgur that you just pour hot water on and then let it sit for a half an hour – it’s too bland. Use the type of bulgur that you need to cook on the stove top. Once the bulgur has cooked, turn it out onto a cookie sheet to cool slightly – about 5 minutes. Soak the slice of red onion in water for a couple of minutes before mincing – this will reduce the raw onion flavor. If you want to make a vegan version – omit the feta cheese and add kalamata olives instead. This salad holds up well in the refrigerator overnight. So if you make it for dinner, make extra so you can have it for lunch the next day. A fresh summer salad featuring nutty, chewy bulgur with cherry tomatoes, cucumber and spinach. Cook bulgur according to package instructions – add bouillon cube to the water before cooking. While bulgur cooks, roughly chop the spinach into small pieces – add to a large bowl. Dice the cucumber, slice the cherry tomatoes in half and mince the onions. Add all to the large bowl of chopped spinach. When bulgur finishes cooking, turn out onto a cookie sheet to cool for 5 minutes. Whisk together olive oil, red wine vinegar, pressed garlic and black pepper. Add cooled bulgur to the bowl with the vegetables and toss. Add walnuts and dressing and toss. Add feta and toss gently so feta doesn’t not fall apart. Hi Crystal – I think people maybe turned off by the name – it’s definitely not the most attractive name. I’m glad though to find another bulgur fan! Have a great day. Bulgur? Never heard of it… But after looking at these pics and the mouthwatering description, I’ll be sure to get some tomorrow!!! Hi Anne – definitely give bulgur a try if you can find it at the local supermarket. You want to get the kind you cook on the stove top (not the kind you add hot water to). Let me know if you try it and what you think. Thanks for stopping by! Have a good one. Bulgur. Never really sure what to do with it, so I forget about it. 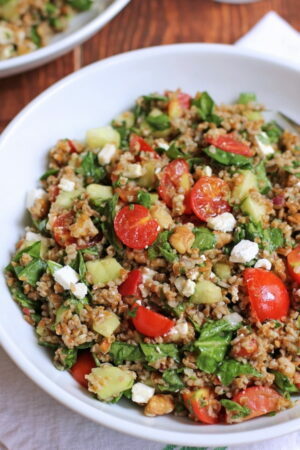 This salad is a beautiful reminder to get that bulgur out and use it! The addition of a bullion cube is so smart and I can see how it would add good flavor to this salad! Love those summer tomatoes and the addition or spinach and feta. Delicious! (Beautiful pics too!!!) Thank you, Geraldine! Pinned and on my list! Hi Traci – your comments are always so nice – thanks so much! I’m pushing for bulgur to become the new quinoa :). Have a great night! 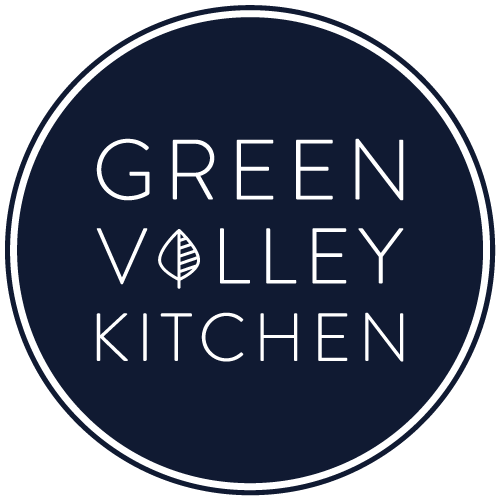 Hi Geraldine – just wanted to say that I really appreciate how you add your notes with tips. Very helpful. Thanks! Hi Jeri – I’m so glad the notes are helpful! Hope you enjoy the salad. Have a good one!